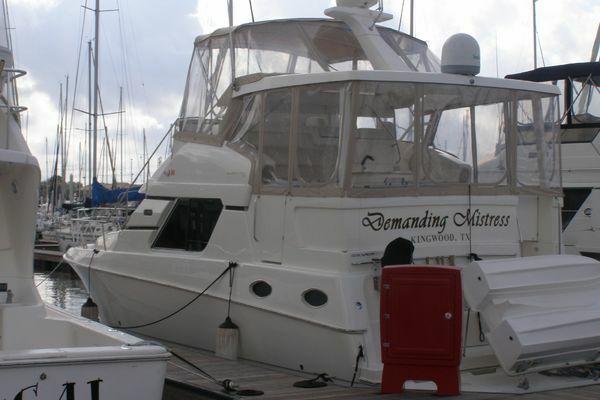 This 48' Ponderosa (CHB) Motor Yacht Trawler is the ultimate live aboard /cruiser with accommodations for plenty of guest. Your first impression when you step aboard is she is a much larger motor yacht due to her open floor plan. She has a large open aft deck, spacious flybridge with plenty of seating. She has had many recent upgrades such as, new generator, water maker, inverter, batteries, battery charger, freezer, 12V fans, oil coolers and exhaust elbows to name a few. She is only used for five months out of the year in the Exumas. 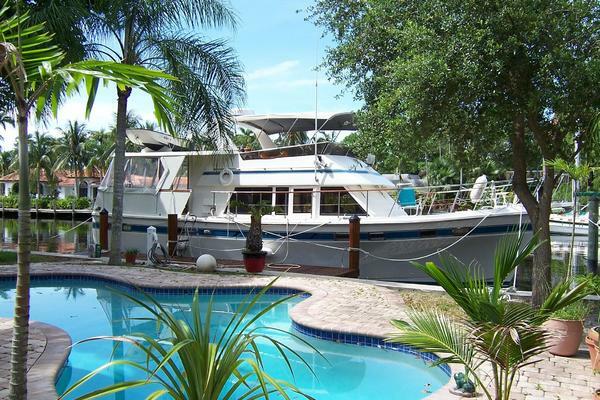 This is the ultimate live aboard, great looper or island boat. Your first impression will be that this is a much larger yacht than you expected. The Sundeck area has lots of room to enjoy view and entertain. There is a wet bar with a stainless steel faced refrigerator and a ample amount of storage. A large circular rattan style table with four chairs makes it a great place to have a meal above decks. The fully enclosed Flybridge provides plenty of seating. The helm station is fully equipped with electronics such as Garmin GPS/plotter, radar, sounder, engine room and transom cameras. As you walk down to the salon you will see how nice and open the boat is with lots of light from the windows. Two recliners, built-in sofa and two chairs. Teak and holly sole flooring through-out.. The main salon is also equipped with a lower helm station. Comfortable in any type of weather. Down to the U shaped galley with microwave, three burner stove and oven, full size refrigerator / freezer, twin stainless steel sinks, trash compactor and nice tile counter tops. All of this is directly across from the beautiful large dinette table. All three heads have VacuFlush toilets and the foward head has a Electro Scan treatment system. The master head has a separate shower. A forward private stateroom has a double bed with lots of storage and the third stateroom can double as a nice office. Going aft is the huge Master stateroom with a queen size walk-around bed, tons of closets and drawers all in beautiful wood. (1) 40 lb. Plow Anchor w/140' Chain 3/8"
Forward and down from the salon is the galley. To starboard is a u-shaped galley with with plenty of appliances and storage for cooking meals dockside or at sea. Directly across to port is a spacious dinette table.